If you’re already working with a stable flock of hens, the next step to consider is adding a rooster. Prepping for lack of food with a sustained protein source for when SHTF can be a lifesaver, and your flock can save you if it needs to. Having a flock during an emergency will ensure you have a stable food source. If you add a rooster into the mix, then you’re also ensuring to have a steady population. Before adding a rooster to your flock, there are a few things to consider: assess your flock at its current state and determine whether your hens can handle a rooster, determine what breed of rooster is right for you, and be willing to practice patience. Otherwise, lets dive into what steps you need to take in order to add a rooster to your flock. These recommendations are general, and can be used for introducing new hens into your flock as well. Introducing a rooster will be a little different from with hens, since hens tend to have a milder manner. You will need to commit to watching your flock while introducing a rooster. Supervision will make sure you can manage bad behavior when it happens, it will also help you understand how your flock behaves with a new member. Make sure your chicken area is spacious and well suited for the needs of your flock. Having an interesting environment for your rooster will ensure it doesn’t get bored and take out its boredom on the hens. A bored rooster will cause trouble. Avoid this by providing plenty of space and having an interesting setting for the rooster to roam. Also, consider your surroundings before getting a rooster. Do you live within the city limits? Is rooster ownership legal in your area? These are questions you need to answer. Some cities have noise ordinances banning the ownership of roosters within city limits. You can’t de-crow a rooster, so make sure you can own one in your area first. Roosters tend to be more aggressive than hens, understanding this from the start is key. When looking for a rooster, either start with a youngster you can train or know the rooster’s past so you’re not buying an animal with violent tendencies. A rooster’s instinct is to protect his flock from harm, and if he’s had a rough life he’ll give you a tough time. Spending some time with your rooster one-on-one will help establish trust with the bird. Hold your rooster often, try carrying them around, scratch their back, and gently pet him. You can try talking softly to your rooster if you think it will calm him while he gets used to being handled. A rooster that is used to people will ensure he doesn’t see you as a threat. A rooster that doesn’t see you, as a threat will be better behaved, and not want to attack you. A rooster can be an excellent alarm clock, but may not prove reliable at a certain time each day. The best reason to add a rooster is to keep a robust flock. A well adapter rooster will protect your flock and ensure its growth by fertilizing eggs. Being a prepper, you want to ensure the best possible circumstances are ready when TEOTWAWKI comes. One way of doing that is by having a robust flock of hens and a strong rooster. There is a chance you could end up with an aggressive rooster, which has pros and cons. An aggressive rooster may protect the flock better, but then it will also try to keep you away from them. 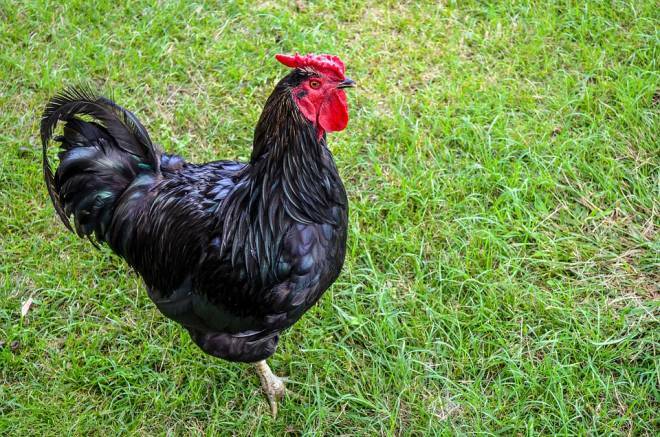 Picking a more docile breed of rooster could help you avoid getting a feisty troublemaker. *Tip: stick to having one rooster in your flock in the beginning. Having more than one rooster in a flock increases the chance of fighting. Only when you have had one rooster for a while, should you think about adding another. Now that you know what to expect, you can begin the steps on how to add a rooster to your flock. Give yourself some time to research rooster breeds and decide whether you want to start with a chick, or purchase a grown rooster. 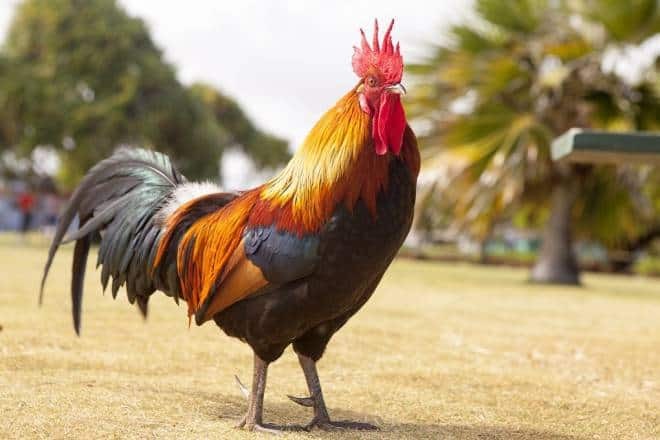 Depending on where you live, you can either purchase a rooster at a farm store, or use local forums to connect with sellers. If there’s a local county fair in your area, consider buying a rooster from a 4H member. *Tip: if you’re starting from scratch with a chick, keep in mind you will need to wait until the chick is fully grown before introducing him to the flock. 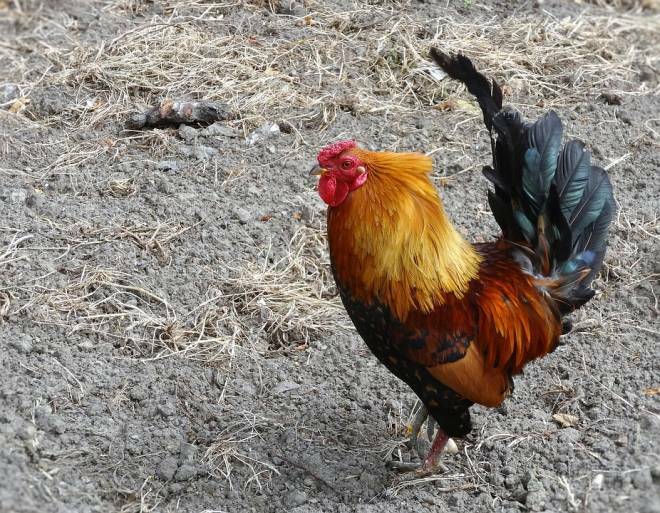 Make a list of what you want in a rooster, this will help you determine what breed will best suit you and your flock’s needs. Below are a few breeds to consider, if you want to see more options visit The Chicken Breed List for more ideas. The Leghorn breed generally likes to forage and roam a lot. If considering a Leghorn rooster, make sure your enclosure is large enough for a chicken to forage from dawn to dusk. The breed tends to be nervous and flighty when humans are around, so be aware that extra time may be needed to acclimate a Leghorn to your presence. Rhode Island Reds are a very versatile breed, although the roosters can be aggressive. The roosters of this breed tend to fight when confined in a small space. Despite their aggression, the birds tend to do well with human interaction and enjoy attention. Minocras are also known as the Red Faced Black Chicken. In general, Minocras are known to be timid animals and not great pet material. Male Minocras also tend to be more aggressive and don’t get along with other males in a flock. Usually, the breed’s aggression is toward other birds, which means they do fine in the presence of people. If you’re looking for a breed that you can easily tame, think about getting a New Hampshire Red. NHRs are typically friendly and laid back. When kept with other birds of the same breed, aggression isn’t usually an issue. Keep in mind that roosters raised by hand from the time they are hatched have a tendency to be tamer than a full-grown rooster purchased from an outside source. *Tip: if you have children consider a breed that can be easily tamed. If it’s a tame rooster, encourage your children to pet him. Exposing your rooster to a lot of human attention can help him acclimate better to the flock when the time comes. 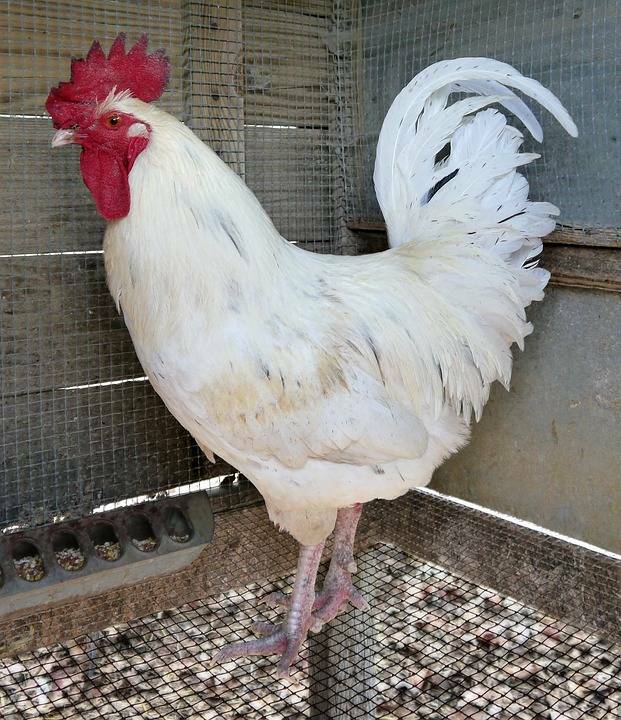 Before introducing your new rooster, reserve a space where you can keep him away from your flock for at least 30 days. Disease can take up to a month to germinate in your chicken, and keeping him separate for a month will ensure he isn’t carrying any sort of bug. Each flock has different germs, and by keeping your new rooster separate for 30 days you will limit the chance of exposing your flock to any harmful bacteria from your new rooster. Observe your rooster. Note if he seems sick, practices cleanliness, or enjoys your company. Look for signs of lice, mites, fungus, or any discharge on the bird. During this transition period make sure your rooster has the benefit by adding supplements to their water. Also consider giving him a little bit of yogurt to encourage his digestion. Give your new rooster a little protein to ensure strength. *Tip: while your rooster is in quarantine, don’t handle him and then attend the rest of your flock. To prevent the spread of germs, wash your hands and consider changing your clothes before going from the rooster to the flock, or vice versa. After the quarantine period, create a pen within your existing chicken enclosure where you can keep your new rooster. Having an area your rooster can live in while still being separate will allow the rest of the flock to get used to him, while also preventing any major attacks. Observe how the other chickens react to having a rooster around. Are they curious? Do they try to attack him through the cage? If your flock seems aggressive, wait. Keep them separated longer. Adding a rooster to your flock should only be done when your hens are relaxed and used to having your new rooster around. *Tip: keep your rooster busy while he’s in his temporary enclosure space. Hang distractions like corn or vegetables he can pick at. If your rooster is bored, he might try to cause trouble through his cage. Once you’ve completed step one through three, and your flock is used to the rooster, you can fully introduce him to the entire flock by letting him into the main pen. Before you add the new rooster to your flock, clear out the flock from their enclosure and let the rooster forage and explore by himself. Doing this will help the rooster become more acquainted with his new home, outside of his temporary pen. Next phase: in the evening, when the hens are roosting, place the rooster in the roosting area. Doing this at night when the rest of the flock is sleeping and relaxed tends to reduce any aggression the rest of the flock may have toward a new member. Make sure there is plenty of food and water available for the flock during this time. Keep multiple food and water stations to prevent squabbling. Hens may also try to prevent the new rooster from accessing food and water, so the more food and water stations available the less likely he will be prevented from eating and drinking. During the day, check on your flock regularly to make sure everyone is getting along. Some initial sparring is normal; just make sure you pay attention to your flock’s behavior. Supervising your flock with its new addition will help you control any fights that occur. Discourage spars by spraying your chickens with water when they get too aggressive. If behaviors don’t improve, consider getting a different rooster. Your flock can accept a rooster, if they’re properly introduced. *Tip: you may experience better success if you’re introducing a rooster that’s the same size as your hens. Keep this in mind if you have a very young rooster. Chickens that are the same size won’t feel as threatened if a new comer looks similar in size to them. Keep an eye on your flock during the first month of introduction. Remove any chickens that have been injured and let them heal in quarantine. Make sure you’re providing enough food and water to keep the flock relaxed. Once you observe your flock engaging in normal activity (picking, dust-bathing, scratching, and foraging) it’s safe to say the rooster has been successfully introduced. Occasional squabbles may occur. This behavior is normal; just keep an eye out to make sure a fight doesn’t get out of hand. Let fights dissolve naturally if you can. If you feel the need, you can discourage sparring by spraying water on fighting chickens. *Tip: always have a plan in case you need to get rid of a rooster. Whether that’s re-homing him, or making him into dinner, having a plan can help make the decision more manageable if you find you’re dealing with an aggressive rooster. Introducing a rooster doesn’t have to be hard, have a plan and be ready to wait. Have patience when adding a rooster and try not to interfere with the natural order of your flock during an introduction. Keep in mind that the best hen to rooster ratio is 10:1 (ten hens for every one rooster). If you dedicate some time and effort into the process, you can achieve a healthy happy flock of chickens. Maintaining your flock by adding a rooster will help you survive any disasters that may strike.